YoYoFactory - Paul Kerbel Signature Yo-Yo! Without individuals who push yo-yo play in new directions yo-yo design would be stagnant. 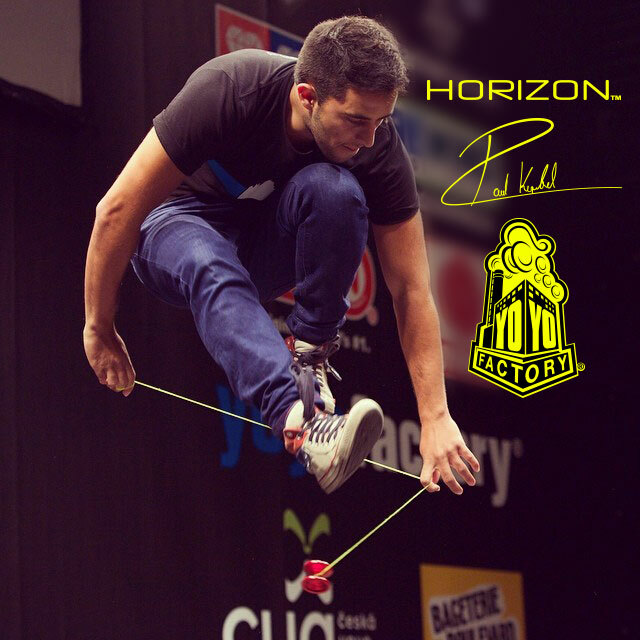 Luckily for YoYoFactory, they work with some of the most creative and amazing players in the world, like crowd favorite Paul Kerbel! This is his signature model - The Horizon! YoYoFactory worked closely with Paul to create a yo-yo that would perfectly compliment his intense and innovative play style. They started with the basics - Make it oversized, seriously stable and extremely long-spinning. Then maximize the catch zone amp up rim weight and finish it off with an amazing fingerspin friendly cup design. What more could you ask for? The only downside we found is YoYoFactory may have gone a little too far with the spin time, it is just ridiculous! There really are NO tricks that need this much spin - go ahead, try your longest combo on the Horizon. In fact, try it twice! You will get closer to achieving it than you think!